Oceana’s new economic analysis finds that the Trump administration’s offshore drilling plan threatens more than 2.6 million jobs and nearly $180 billion in GDP for only two years’-worth of oil and just over one year’s-worth of gas. 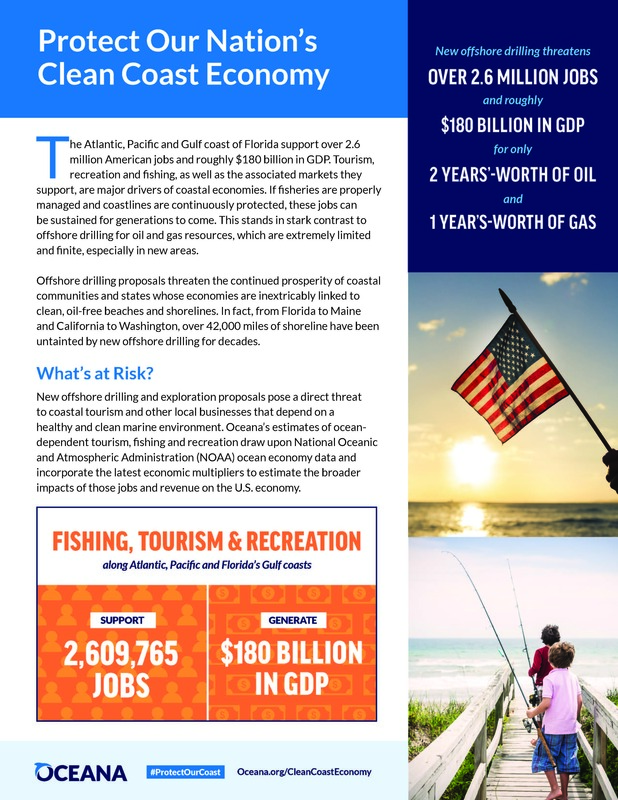 Specifically, the analysis looks at the latest available data for ocean-dependent jobs and revenue from fishing, tourism and recreation along the coasts of Atlantic and Pacific states, as well as Florida’s Gulf coast. Threatening our clean coast economy for very little offshore oil and gas would be a shortsighted and permanent mistake. Healthy oceans and clean coasts support jobs and revenue that are consistent year after year if properly managed and continuously protected.